Even though Southern California’s nearly-constant good weather and sunshine means that the region doesn’t experience the dramatic color changes that come with the change in the seasons. 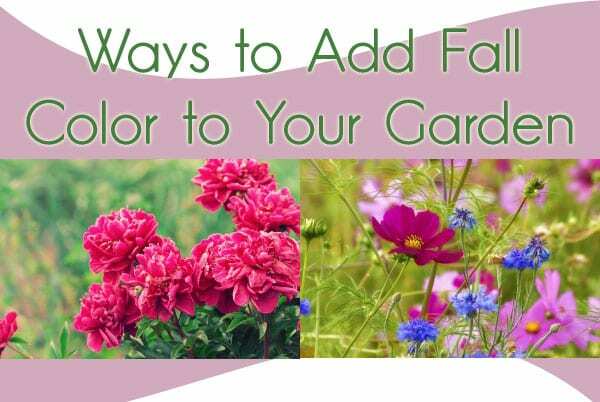 This doesn’t mean you can’t have lots of fall color in your garden though. The following ideas are just a few ways you can do so. With their delicate purple petals contrasting with golden yellow middles, California aster is the perfect companion to California goldenrod and/or Zauschneria Catalina. Planting California aster beside these other two flowers will prompt the flower to bloom during late summer and continue into winter. You might also hear the Christmas berry being called Toyon berry. Characterized by clusters of red berries being cupped by green leaves, the Christmas berry tree is a festive addition to any Southern California garden. A drought-tolerant choice, Christmas berry can grow to heights of about six feet tall. However, it’s not unusual to see older trees that are 15 feet in height. A word of caution: ingested in large quantities, Christmas berries can be poisonous. For this reason, this plant might not be a good choice if you have children that might be curious enough to taste them. If you’re searching for a hearty tree that does well in the Southern California region while adding brilliant color to your garden this fall, look no further than Ginkgo Biloba. Available in varieties, such as Autumn Gold, that provide seasonal colors, Ginkgo Biloba can reach heights of up to 60 feet tall and 35 feet wide. Just make sure that the variety you purchase is a grafted and male. The female variety drops a smelly cone after blossoming that smells like rotten butter. If you’re looking for a more subtle splash of color for your fall garden, the Los Angeles Big Berry Manzanita might be a good choice. At the tips of its red branches are delicate white flowers. Expect this flower to vary in size depending on where you live with it sprouting from one to six inches high. You really can’t find a tree that’s better suited to Southern California than the popular crepe myrtle. With your choice of red, white, purple or pink blooms from summer until fall, crepe myrtle is a moderate height at maturity and well-suited for a landscape that needs to be drought tolerant. Expect your crepe myrtle to reach a height of around 20 feet at the most and for its leaves to change to orange, red or yellow. It might surprise you to learn that peonies can thrive in the mild climate. One reason why peonies are so popular is that the flowers come in a variety of shapes and colors. For many people, seeing peonies is a signal that fall is in its way — whether the flowers are in traditional autumn colors or not. Succulents are often thought to be solely green in color, but the Sticks on Fire tree turns this assumption on its head. With leaves that are roughly shaped like pencils, this tree spends the summer yellow before turning to a darker orange as the weather turns cooler. In addition to being low maintenance and easy to transplant to other garden areas, Sticks on Fire is ideal for smaller spaces. It grows to a maximum of about six feet and can get as wide as five feet across. The Chinese Flame tree is native to Asia and features yellow flowers. These turn into paper seed packets that are rose in color and resemble Chinese lanterns. This deciduous tree can grow as high as 30 feet tall, making it a popular shade tree that often found in parks. Because it needs full sun and has roots that tend to behave themselves, the Chinese Flame tree is a good choice if you’re looking to add some color to your lawn or near your pavers. An annual flower that needs little in the way of maintenance while also growing rapidly, zinnias add tons of color to your fall garden. While they’re available in a range of pretty hues if you want to add autumn colors to your garden, look for orange, yellow and red flowers. It’s important to deadhead your zinnias so you’ll get the maximum in blooms. They also attract butterflies to your garden if you’re trying to entice the insects to visit you this fall. When you’re thinking about the flowers and trees that you want to add to your yard and garden this fall, head over to Green Thumb Nurseries. There, you’ll find Southern California’s best selection of plants for your fall garden as well as the friendliest staff around! Stop by and visit us soon and let Green Thumb Nursery bring fall to your home!